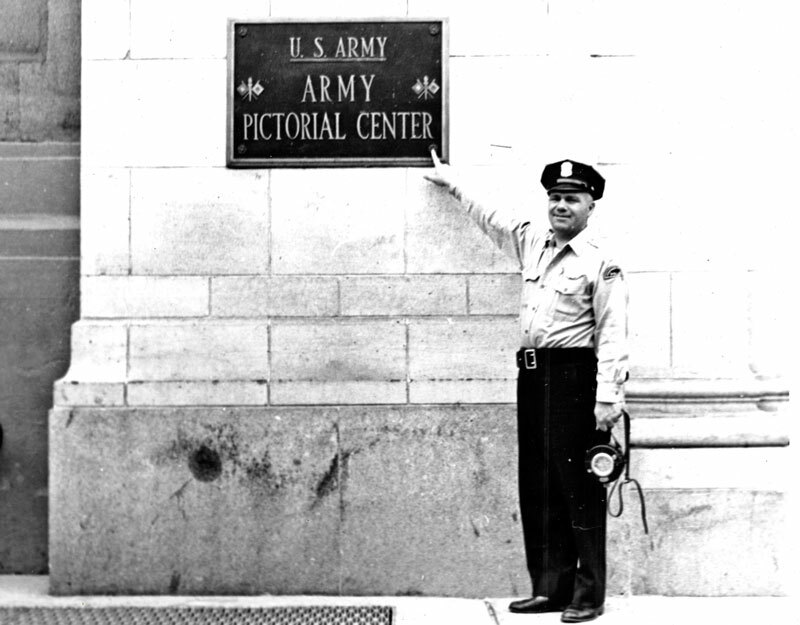 Ron Hutchinson, the GI in the location photo above, came to Army Pictorial Center in January 1961as a still photographer and quickly moved to motion pictures as an assistant cameraman. 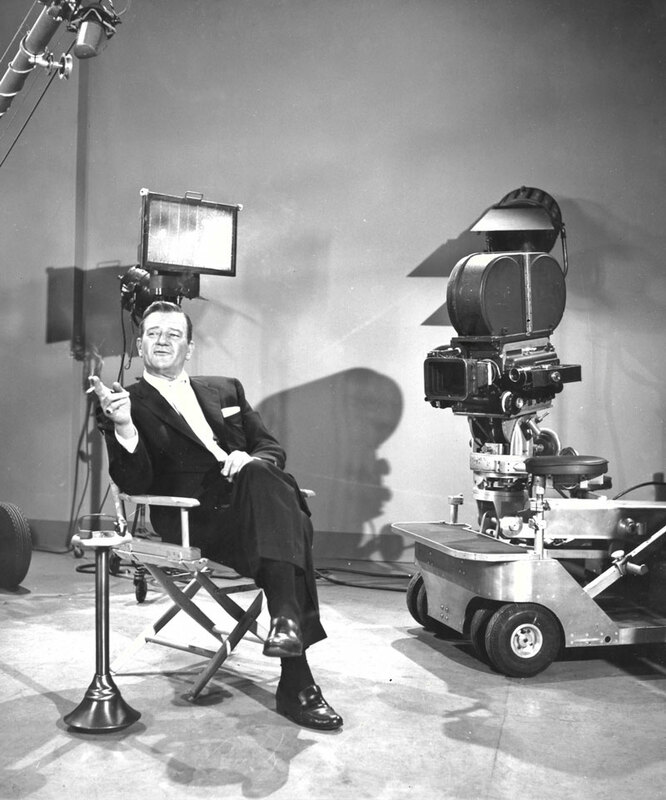 When Hutchinson was not with the camera he worked in the supply room, and as a projectionist for the rushes the next day (screening the shots of the previous day). 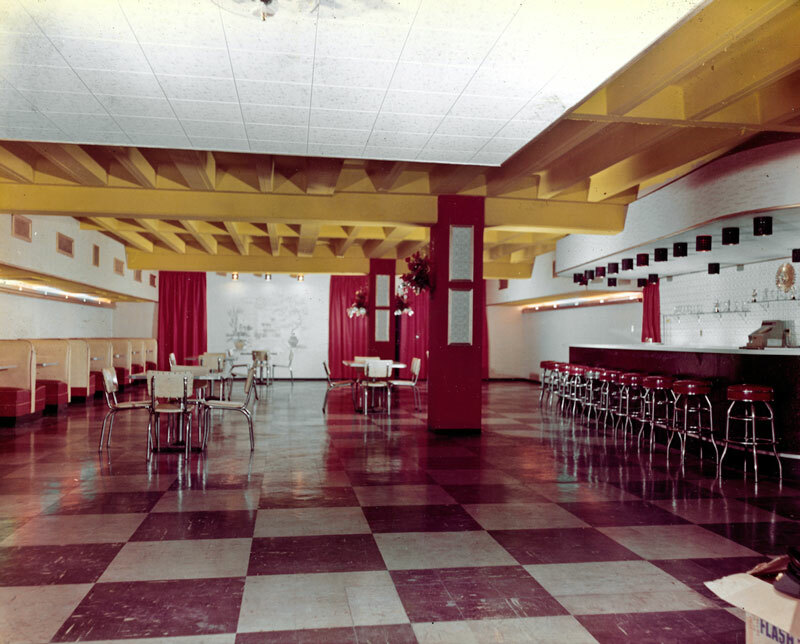 He left APC in January 1963 as an SP5 to go to the Pentagon as a projectionist for his last 6 months. 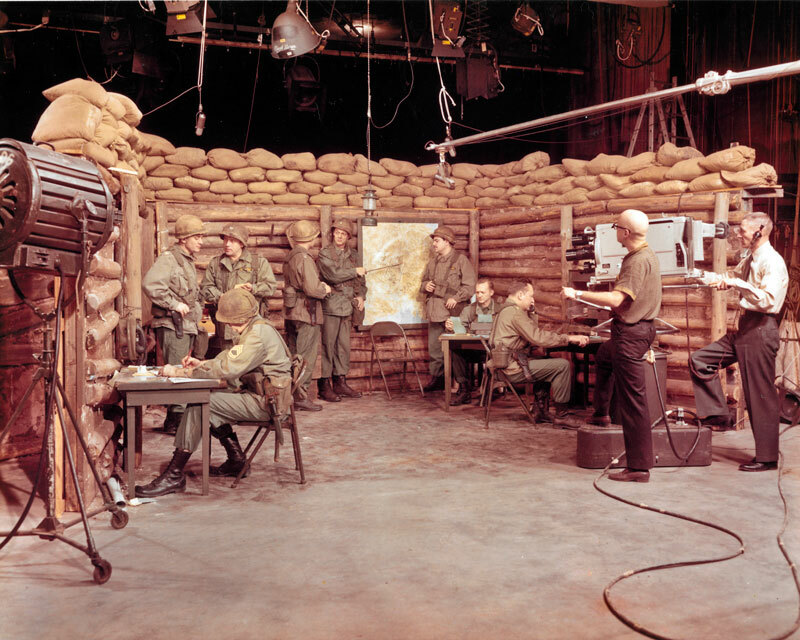 Some of the guys Hutchinson served with and worked with during that time that went on to be famous were Todd Armstrong (starred in Jason and the Argonauts (1963,) Lloyd Bautista (see photo and note below,) William Christopher (Father Mulcahy on the TV series MASH,) Peter Bonerz (the dentist friend on the Bob Newhart Show,) and Alexander Scourby. 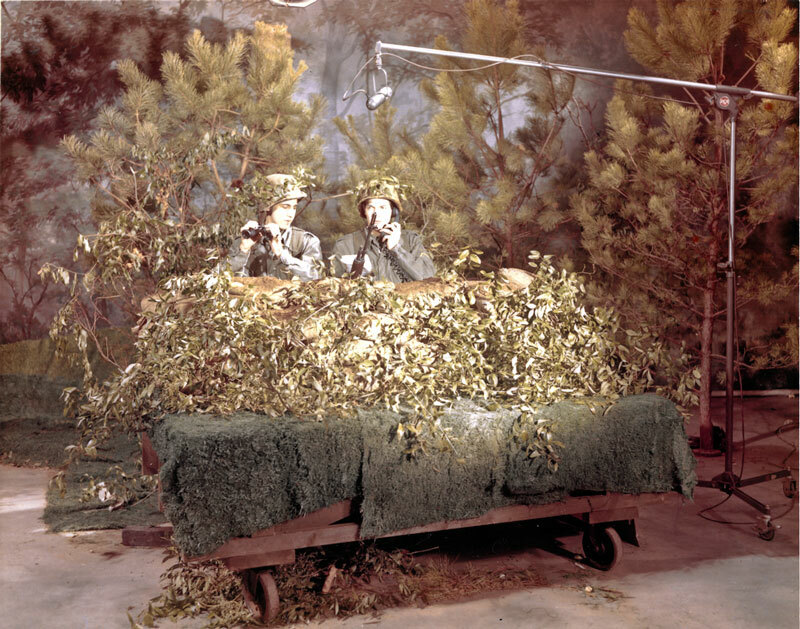 Lloyd Battista (at left in photo above) was one of the actors who worked in APC films and went on to successful acting career, with credits including 43 episodes of Mystery Theatre (1974 - 1982,) All My Children (1970,) Fievel's American Tails (1992,) plus many more series and films. 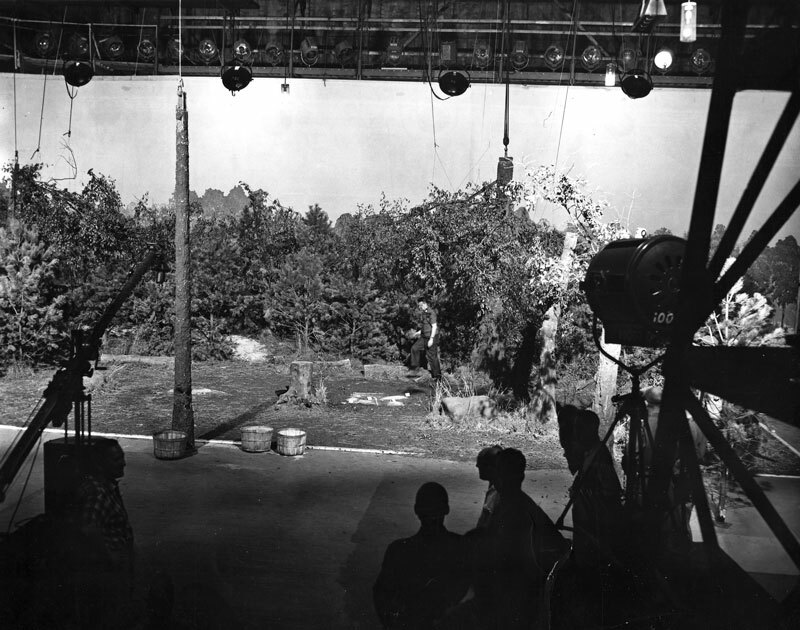 How the set looks, above, from behind the camera. 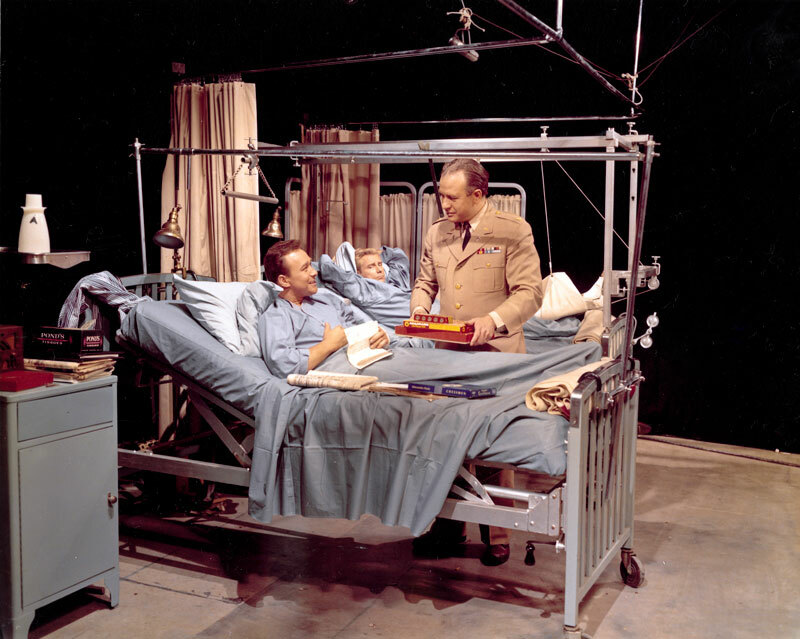 This hospital scene, above, is an otherwise unidentified APC set photographed by Ron Hutchinson. 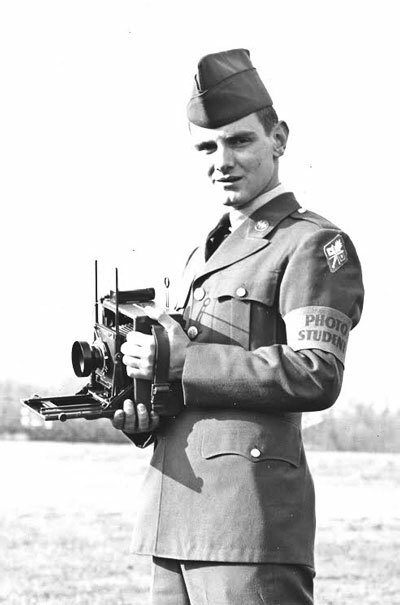 Ron Hutchinson, above, as a photo student in Fort Monmouth, New Jersey, October 1960. 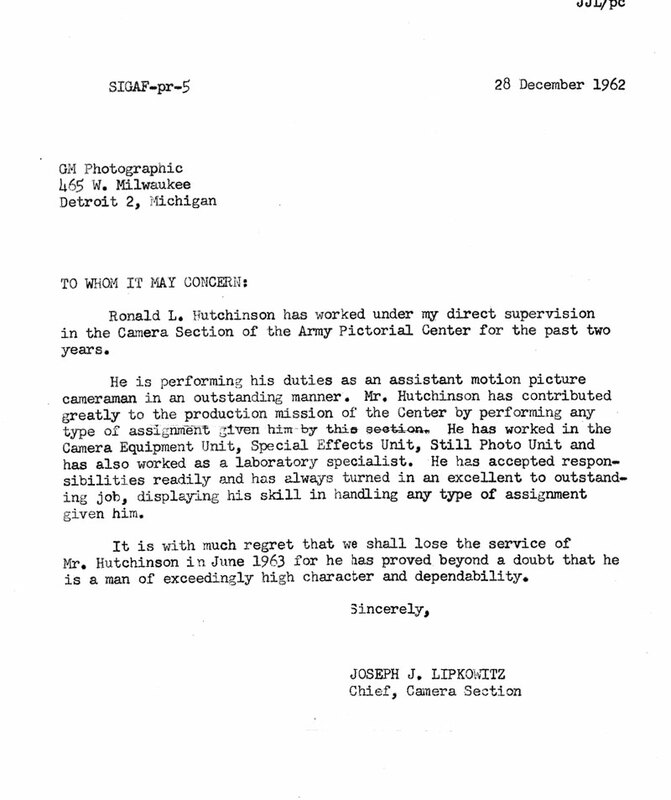 Above was a letter from Joe Lipkowitz, chief of Camera Branch, to General Motors Photographic in Detroit, Mich., where Hutchinson wanted to work when he got out of the Army. "Pretty special letter." 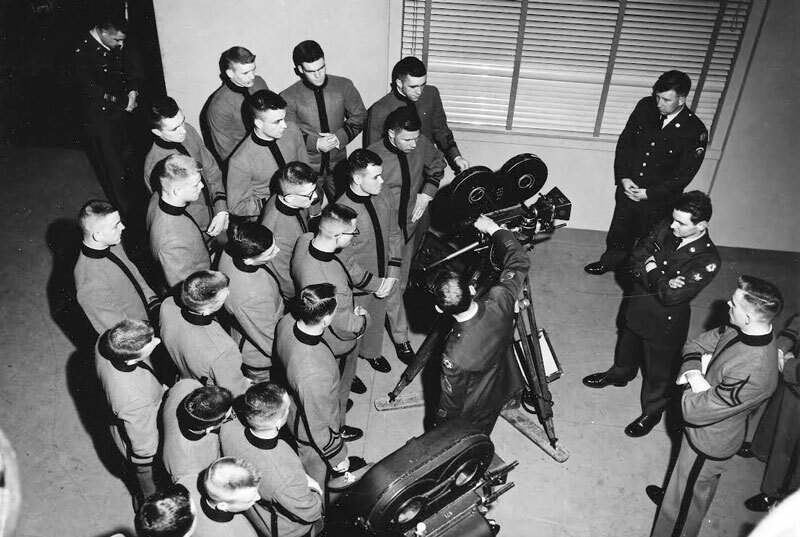 West Point Cadets visited Army Pictorial Center to learn about the studio's production capabilities. 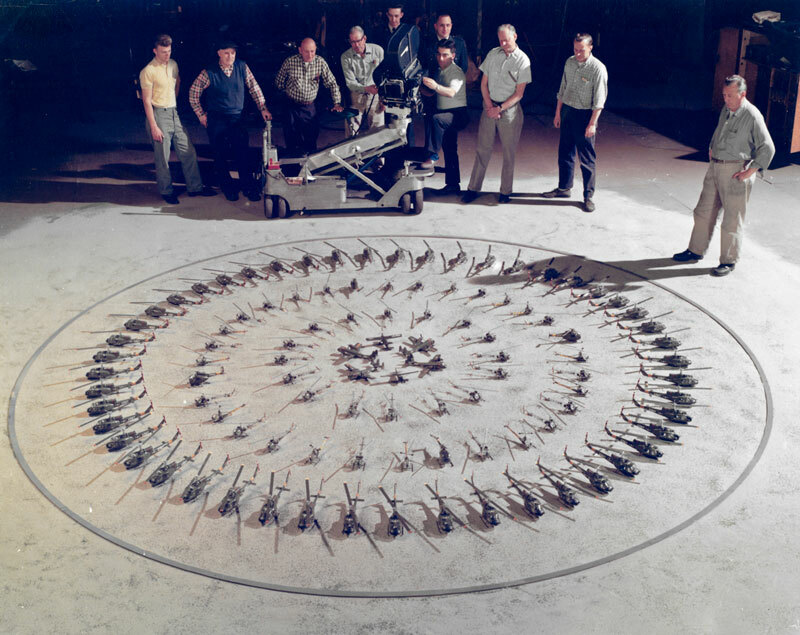 Ron Hutchinson is in the middle on the right. 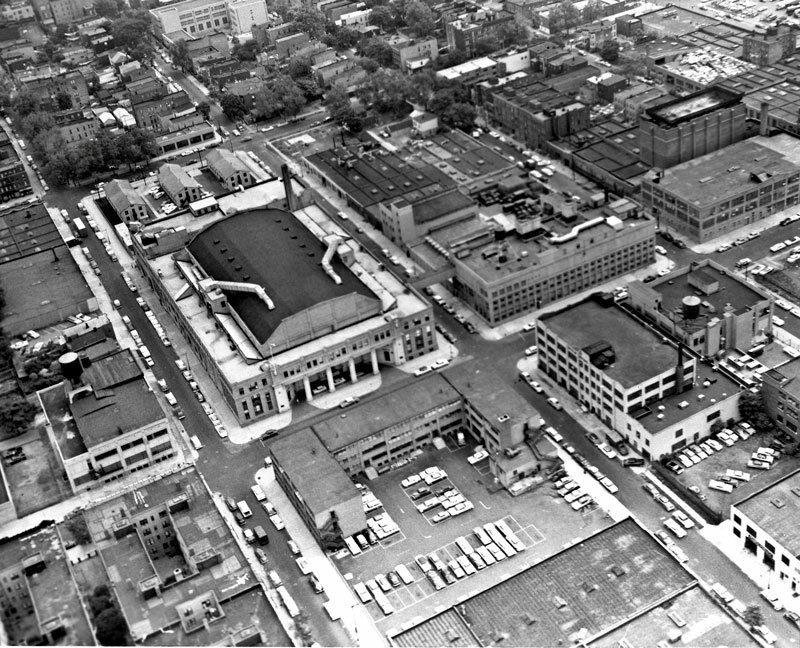 An aerial shot of Army Pictorial Center in the early 1960s shows the iconic studio building facing Troop Command across 35th Street, with the laboratory building to the right of the studio. 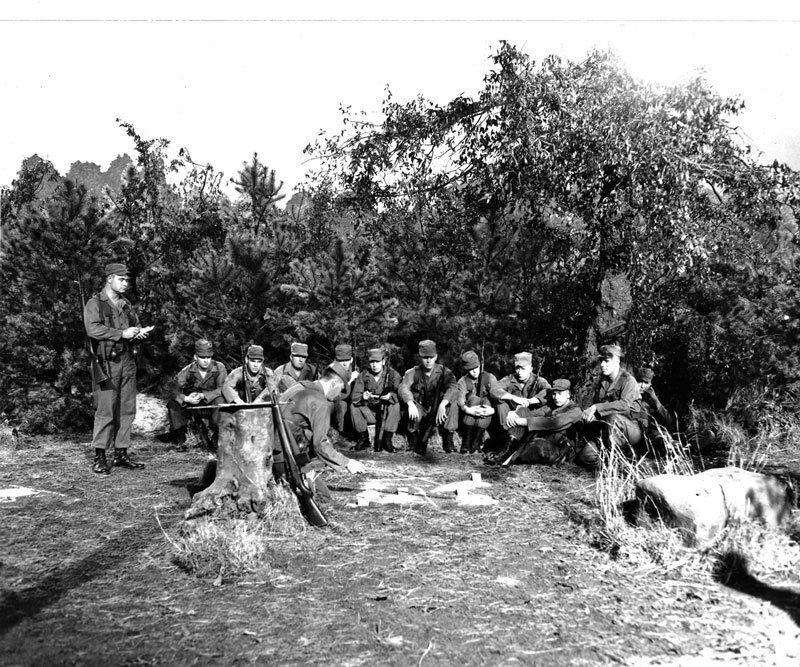 GIs assigned to APC lived in the Troop Command barracks. 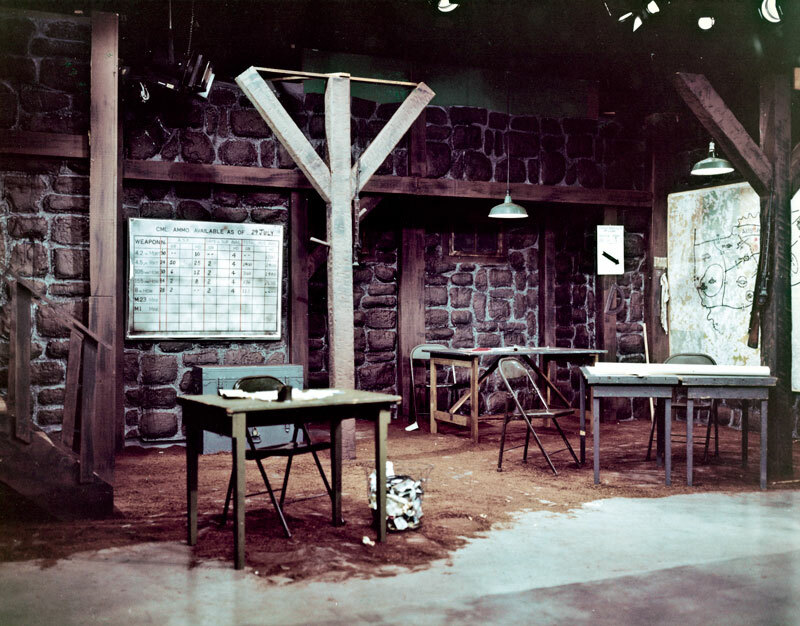 This shot of the front of the studio building, above, features an unidentified civilian guard. 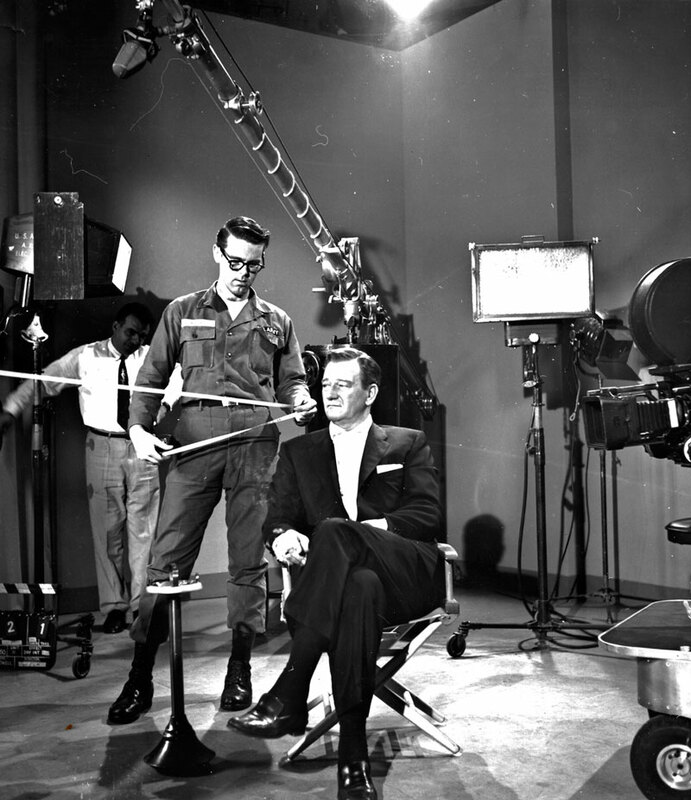 John Wayne, in photos above and below, appeared in "The Challenge of Ideas, (Part I) and (Part II,)" a 1961 production from the Army Pictorial Center featuring Wayne, Edward R. Murrow and others discussing the ideological battle between U.S. and Soviet Union. 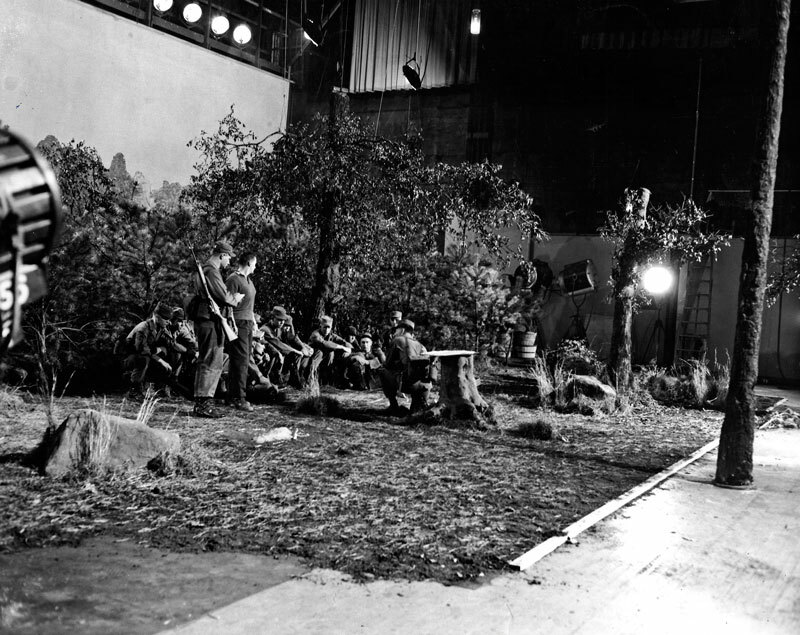 The GI camera assistant checking focus, above, was named Totten. 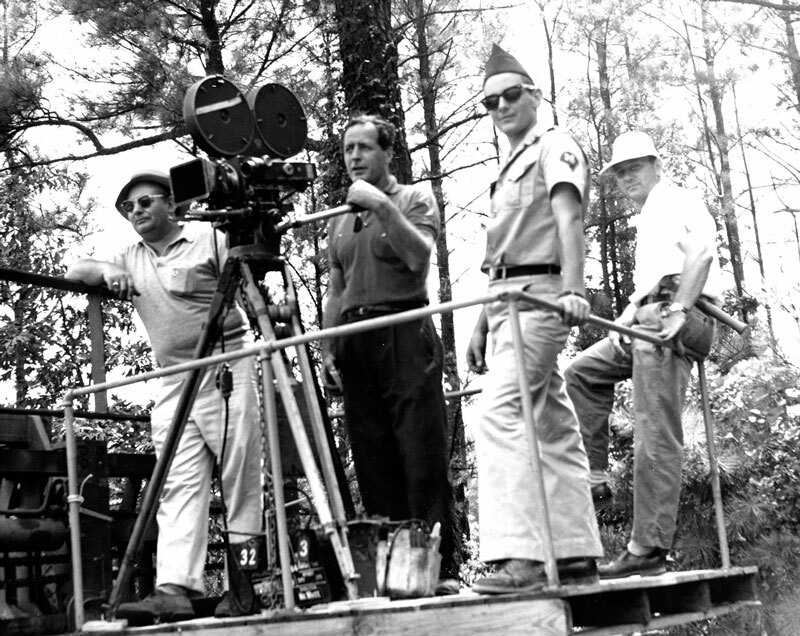 Cameraman Chris Mauriello, Sr., at right of camera in the photo above, is featured in a series of pictures provided by Ron Hutchinson and now displayed on the Chris Mauriello page. 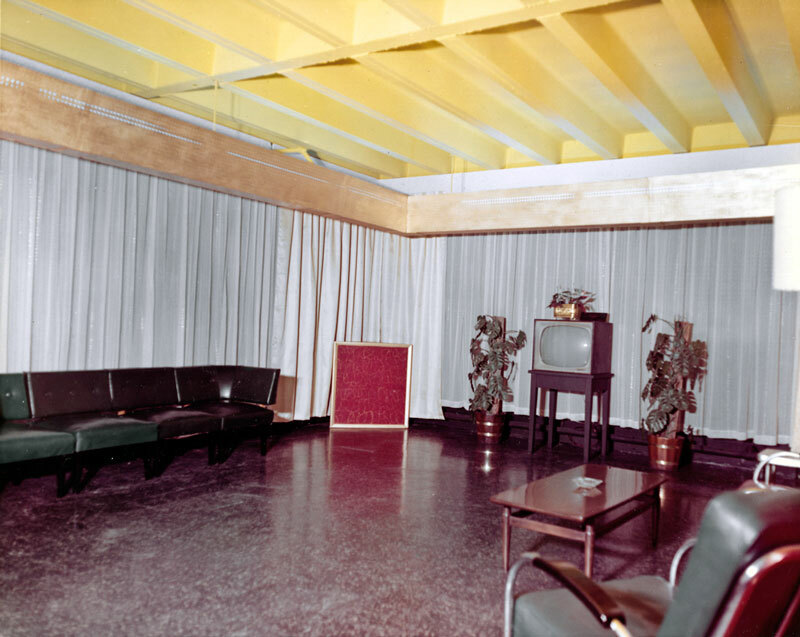 The photos above and below show the enlisted men's recreation room.